Gray-ri imped Tree-Swift l 'nlikc most swifts, this tree-swift perches on twigs in treetops to rest. It hunts insects, either in darting sallies from a perch or in cruising flight. It often occurs in small flocks, but nesting pairs defend their territory aggressively Flight consists of bursts of rapid wingbeats and glides on slightly lowered wings. • NliST A tiny cup for the single egg. placed alongside a twig on which the bird sits to incubate it. 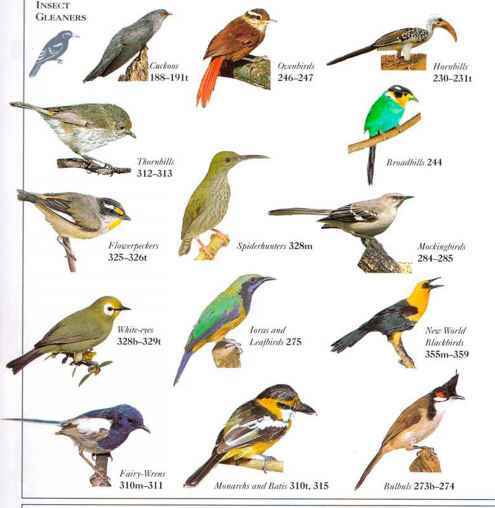 • DISTRIBUTION Malay Peninsula, and Sumatra. Borneo, Java, Bali, and Sulawesi in Indonesia. 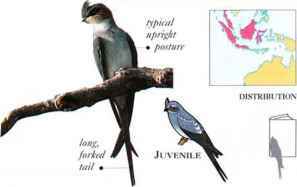 A squarely built swift with long, slender, curving wings and a short body, the W hite-throated Needletail has projecting spiny tips on the short tail feathers, to which its name refers. In flight it reveals its white throat and a curved white mark at the rear of the belly. It occurs singly or in small parties, catching insects on the wing and uttering screaming calls. Asia and the Himalayas.' as far south as New Zealand. I his small swift has long wings and a short, square tail. It lives and nests in flocks. 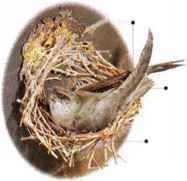 Birds roost by clinging inside chimneys or hollow trees, where they also nest. They are extremely agile in flight, uttering short, twittering calls. At the nesting colonies, extra adults often help feed the young. • NliST A half-cup made of twig fragments, glued together with saliva, inside a chimney or hollow tree. • DISTRIBUTION Breeds in K.Canada and I ISA. Winters as far south as N.K. Pern.